Restorative Justice: An essential component to the legal system. Canada is a nation based on settlement, colonization and European governmental ideals. The policies and systems developed within this European structure have historically been racist and discriminatory towards those that do not fall into the category of Caucasian, English speaking and/or Protestant. As a multicultural nation Canada faces issues with race and ethnicity every day and in every facet of its social and governmental organization. Since coming into existence as a nation, racism has been prevalent and seemingly accepted by those in power and control. Overall these issues of racism and prejudice have been downplayed and attempts have been made to make Canada a truly multicultural nation with equality throughout for all members of the Canadian community. This is not an easy task and will take much more time, effort and understanding. With the development of government also comes the development of law and a legal system for guidance and implementation. Canada, like other nations colonized by the British Empire, grew out of racism and the idea of “White” European supremacy; so too did the legal system. A major problem the Canadian Criminal Justice System (CCJS) has always had is the over representation of visible minorities in prisons. The CCJS racialized groups, making the judicial system harmful and oppressive to minorities. One theory for the disproportionate number of aboriginal offenders in the criminal justice system is the marginalization experienced by aboriginal children in residential schools. The racist situation created a demand for less incarceration and alternatives to the established CCJS. The CCJS has changed over the years to accommodate certain social concerns or factors, such as the rejection and elimination of capital punishment and debtor’s prison. The need for further change to the system in order to protect and reflect the needs of minorities, especially in the Aboriginal community, is still evident. This is where the concepts of restorative justice come into play. 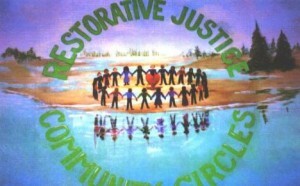 Restorative Justice (RJ) is an integrated component to the existing CCJS, which gained momentum in Canada in the 1990’s and Correctional Services Canada initiated an annual restorative justice week in 1996. RJ can be found in other countries, especially those with large aboriginal populations. Aboriginal peoples are the indigenous people of the land, before European settlement. These peoples have suffered from racist policies and other factors that have marginalized them from the system of government in place, which is why Restorative Justice is important. Restorative Justice has its roots in aboriginal law, which has as its fundamental values: respect for human dignity, honesty, responsibility and healing. RJ encompasses various practices at different stages of the criminal process and can work as an alternative to or alongside the existing system. RJ seeks to identify and address the need to see resolution that affords healing. Through healing, the hope is for reparation for harm done, reintegration of the offender effectively back into the community and to prevent future criminal offences. It deals with community and people. The CCJS is controlled by professionals and is seen as violation by the state, whereas RJ offers a chance at community involvement and community-based healing. RJ is more commonly used in cases involving children and less serious crime, but can be used with adults and the most severe offences. Restorative Justice is not a replacement for the existing Canadian Criminal Justice System, but it is a necessary tool to be used in cases where it is applicable and has a better chance for success. The goal is healing for all parties involved in a criminal offence and so includes the offender. Through healing, repeat offences (recidivism) is less likely than through incarceration. 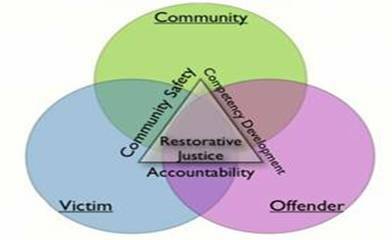 Restorative Justice contributes a more humanistic approach to crime, criminals and victims. It provides a voice for those affected and an alternative chance for resolution. It is very necessary for Canada to continue to invest in Restorative Justice Programs; not only to reduce incarceration rates and hopefully reduce individual recidivism, but to address the concerns of cultural differences and practices. Incorporating RJ into the legal system is one of many basic, but needed steps toward a more equal future for Canadians. This shows progress in governmental policy to recognize the mistakes and challenges that exist within a system dealing with a multitude of races, cultures, beliefs and practices; and how to appropriately deal with diversity. Dickson-Gilmore, E. J. and Carol LaPrairie. Will the Circle be Broken? : Aboriginal Communities, Restorative Justice, and the Challenges of Conflict and Change. Toronto: University of Toronto Press, 2005. Hindle, Karen, Philip Rosen, and Canada. Parliamentary Research Branch. Restorative Justice [Electronic Resource] : A Complementary Approach to Resolving Criminal Justice Issues. Ottawa: Library of Parliament, Parliamentary Research Branch, 2004. Rugge, Tanya, Terri-Lynne Scott, and Canada. Public Safety Canada. 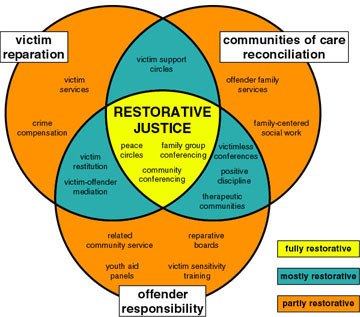 Restorative Justice’s Impact on Participants’ Psychological and Physical Health [Electronic Resource]. Canadian Electronic Library. Canadian Health Research Collection. Ottawa, Ontario: Public Safety Canada, 2009 (Saint-Lazare, Quebec, 2010. Whyte, John D., Saskatchewan Institute of Public Policy, and First Nations University of Canada. Moving Toward Justice : Legal Traditions and Aboriginal Justice. Purich’s Aboriginal Issues Series. Saskatoon: Purich Pub., 2008. Annotated Bibliography: Victims and Restorative Justice. www.csc-scc.gc.ca/text/rj/rprts/biblio-eng.shtml Last modified July, 29th, 2011. Correctional Service Canada, prepared by the joint subcommittee on victim issues 2009.